The man who would have been one of the greatest riders never to win a World Individual Title - except that he did... eventually! Along the way, he thrilled the masses at Dudley Wood regularly living up to the reputation of not being able to gate for toffee. Time and time again, it was Jano last into the first corner but all too often for the oppositions liking, he’d have picked off three riders in about as many laps. The party piece was that last bend swoop at the ‘Wood which was lined up for a lap and then executed to perfection so that at least a wheel made the difference as two bikes roared over the finish line. It was 1983 when the "diminutive Dane" landed on the scene in Cradley Heath. His first British meeting heralded a five point return in Birmingham’s Second City individual Trophy on 18th March. His future had been plotted for Dudley Wood almost a year earlier when he was recommended to Heathens team manager Peter Adams by his countryman, Bent Rasmussen. The ensuing months brought three more clubs knocking on his door but in August, Pedersen publicly pledged his future to Cradley - much to the dismay of Birmingham and Dan McCormick. Jano finished his debut season with a marvellous 7.20 league average and Cradleys team total soared over a staggering 60-plus points as they won the British league again. The decision was then made by new manager Colin Pratt to loan the Dane out and he spent 1984 with Sheffield. Despite that season being marred by a broken arm, he did enough to convince Tigers’ promoter Maurice Ducker that he was worth buying. Fortunately for Heathens fans, Pratt refused to sell and Pedersen’s return to Dudley Wood for 1985 saw the start of an uninterrupted 8-year stint in the Black Country. Little Jan O. Pedersen (the ‘O’ is for Osvald and used because there was another Jan Pedersen racing in the same team when he started out in Denmark) has achieved tremendous success for club, country and individually. He has picked up World Individual medals of bronze, silver and gold, and took the latter with a memorable performance in Gothenburg, 1991. To the surprise of the Speedway world he took that title with four and a half text book starts - with only one blip when he was second until powering out of the first turn. It was a classic performance which was fully deserved and probably even long overdue. I’m sure he won’t mind me saying though, that his racing career is much better characterised by an infamous Gold Bar Final in 1989. Eight riders, eight laps and Jano on the very back of the grid. I don’t need to tell you who won! 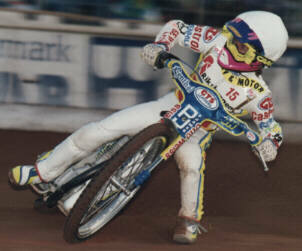 The illustrious Speedway career was brought to a premature end in his testimonial year. In fact, it was less than a fortnight after Pedersen’s 10 year testimonial at Cradley when he crashed in Denmark and suffered a serious back injury. He never raced competitively again after that - at least on a Speedway bike anyway. Since ’93 he has been doing some saloon car racing in Denmark and won a championship in his first season. He has also had one year spells as team manager with Oxford and promoter when Cradley spent the year riding at Stoke. In 1999 he is supervising the testing of a new rev limiter on behalf of the BSPA. In 1999, JanO was tempted out of retirement - for one night only! He raced in the 25th Anniversary meeting at Denmark's famous Vojens track. A series of competitive races were held involving old and current international stars, including Ivan Mauger, Peter Collins & Anders Michanek. JanO managed to win every one of his races in his first track return since his career-ending accident in 1992. Everyone at the event was impressed with how quick Jano was and how little his style and ability had changed. So much so that in an even further twist to the story, he was approached by Wolves promoter Chris Van Straaten to make a full-time return to the British Elite league with the Monmore side. Pedersen still has a house in Brierley Hill in the Midlands, and is involved in speedway testing a new rev limiter in the UK. He is also a successful businessman and has broken into the world of saloon car racing. Unsurprisingly though, he turned down Van Straaten's ambitious offer and ruled out any permanent return to two wheels.